A few days ago I posted a small tool to download songs from Google Music. The main reason was to allow me backup my data, but let’s be honest, I love to do this kind of stuff, and I wasn’t going to stop just there. Google Music allows you to store up to 7.000 songs. That’s it. No size limit, just 7.000 songs. Wouldn’t it be great if, somehow, you could upload a regular files instead of just songs? Think about it, 7.000 files, of any size, stored for free! Today I’m releasing another tool that makes regular files appear as songs to Google Music. To put it simple, files have two main sections, header and content. The header is a bunch of metadata that describes what kind of information the file contains (music, video, document…). This tool takes a real mp3 and uses its header, along with a little bit of its music, and then appends the file you want to store, making Google Music believe it’s a real music file. Doesn’t it make my file bigger? Yes, it does. Exactly 100kb more. But, if the file seems to be an mp3, how the hell am I gonna use it afterwards? 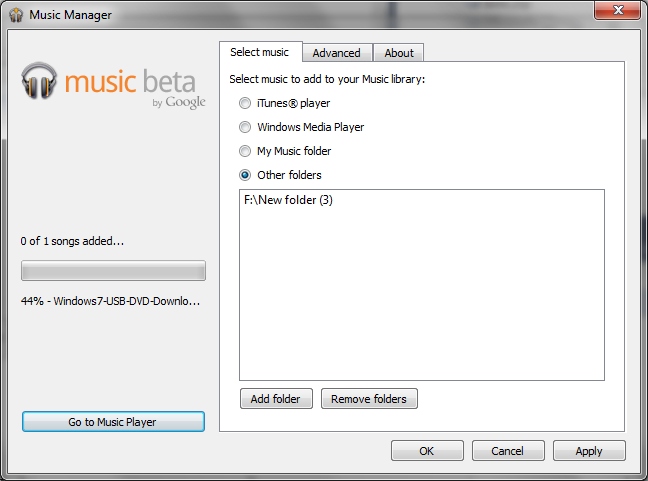 Will I have my data files and music files mixed in Google Music? Yes, and no. You will see all your uploaded data files inside the album “Data” of the artist “Google Data Upload”. You will be able to create playlist that mix data a real music files… but that will be a really weird thing to do, won’t it? It’s a command line tool. If you know nothing about command line you can either learn it or wait until I create a graphical tool to do it… which might be available tomorrow or never. How do I upload the hidden file? Why are you developing this? Because I want to. Some people have fun solving puzzles… I do this. You can find the code at my GitHub space. I want to know more about the technical details. Fair enough. Let’s start saying that my first attempt was to make use of the ID3Tags by injecting the desired file as the cover of the mp3. I’ve used that trick in different occasions to defeat some monitoring tools, however Google Music looks to this kind of metadata and attempts to resize the cover. I’m guessing they try to do this to save space. Obviously it can’t resize a binary file, so instead of ignoring it, it deletes the metadata it does not understand and thereby making this trick useless to my end. The current implementation relies on the fact that file headers can be stored at the beginning of the file (that’s why it’s a header) but also at the end of it. The vast majority of them have their headers at the beginning, but some of them, like zip files, have it at their end. The tool also adds some information to the ID3Tags. To be more accurate, it sets the Album to “Data”, the artist to “Google Data Uploader” and the title to whatever the name of the file was. This makes it easy for you to find your files within Google Music. Google Music expects to find an MP3 file, so starts looking at the beginning of the file. It finds a valid MP3 header, and therefore decides to upload the whole thing. Once the file is in Google Music, you can “play it”. It will go for a few seconds and then suddenly ends as soon as it runs out of song and reaches the End of file (which is in fact the end of file of the zip file). If you download the file (using the tool I posted before) you’ll find yourself with an mp3 slightly different from the one you’ve uploaded. Google Music sends you the file without the ID3Tags. That’s not a problem cause we don’t need it anymore, all the information we care about from now on is inside the zip file which remains unaffected. You can use this tool (–unmerge option) to “split” the zip file from the mp3 and extract all its files or you can just rename the file to “.zip” and open it with a zip program that doesn’t care about malformed files (like 7-Zip). 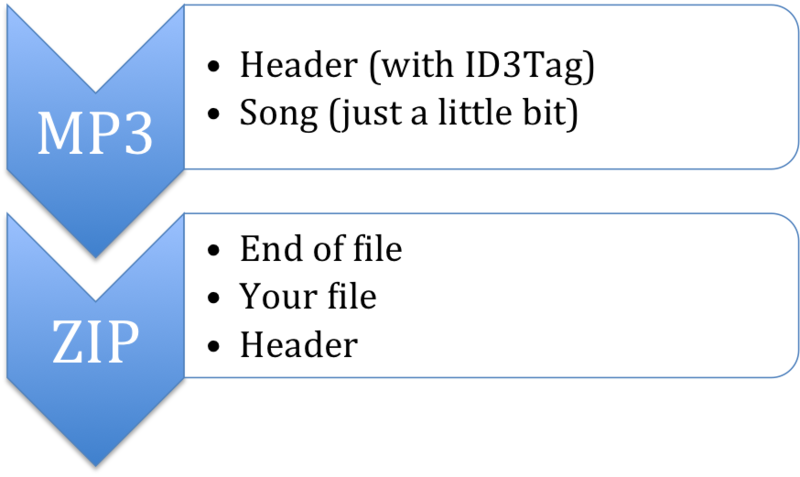 This works because, under the assumption that the file is a ZIP, the program should start reading from its end, finding a valid header, continuing with the content and reaching the “End of file” preventing it from access the mp3 data. So you’re just taking advantage of a naïve implementation of Google’s uploader, aren’t you? Definitely. This is an extremely easy trick that works just because Google is not checking the content of the whole file assuming that if the header says the file is an mp3, it has to be an mp3. This entry was posted in How-To, Tools and tagged binary, data, file, google, music, upload, uploader on August 8, 2011 by Carballude.